Because this little red dot is just… too tiny. Too late to change flights coz hubb already confirmed with his employers abt being away only for 4 days. And theyre pretty sticky about this kinda stuff. So I spent several hours surfing online on how to get to Lake Toba from Medan, accommodation, reading reviews, blogs, tour operators etc. Took me 3 solid days to finally grasp the enormity of the trip. The drive from Medan to Lake Toba is 1 thing, then theres this gorgeous island called Samosir in the middle of the lake that is a must-g0. On this island itself there are several places of interest. Away from the lake, people were raving about this town called Berastagi which is 2 hours away from Medan. Medan itself is a bustling city. After discussing with hubb, I proceeded to book 1 night on Samosir island at the Samosir Villa Resort, 1 night in Berastagi at Mikie Holiday and 1 final night in Medan at Grand Swiss-Belhotel. 1 can easily take all the public transports available with shared taxi being the most popular. But after reading several reviews on tripadvisor, I decided to hire a personal guide/driver and private transport for ease and comfort. AND SAFETY. hehe. Hubb didnt mind the extra cost. So I spent another coupla days searching for the right operator. And its no mean feat. So many tour operators! So many reviews! I even had to rope in my little sister and friends to help me out! In the end, I found a good review on this person named Ridu. He has a whatsapp number and facebook page. When I looked up his fb account, I found out that he is the owner of tour operator in Medan which specializes in trips to Lake Toba and Berastagi, Kampung Wisata Tuktuk Samosir. Perfect! So hubb and Ridu exchanged whatsapp messages and discussed about our itinerary. Ridu mentioned that where we go and what we do will be entirely up to us. He will advise if its possible or plausible depending on location, time and traffic conditions. We confirmed with him and agreed on a good price for his services… after conversion, it came up to about sgd330. So on 17th December, we took the 1040am flight from Spore and reached an hour plus later to Kuala Namu Airport in Medan around noon Indonesian time. The airport is fairly large, a new one apparently. Just up and running the past couple of months. The old Polonia airport it seemed was getting too small and congested. We cleared immigrations and collected our luggage pretty easily. As we walked out, we saw 2 men holding a placard bearing hubb’s name. I knew neither of them were Ridu because i’d seen his fb pics. The one who introduced himself was Ramses, our guide for the next 4 days and Ridu’s business partner. He is a Batak guy born and bred on Samosir island. He had the driver with him, Torang, who didnt speak much but smiled often. Both were funny guys with a cheerful disposition. Ramses especially, was rather knowledgable. We drove out of the airport grounds in a 7 seater Toyota Innova which we had all to ourselves (2 of us plus 2 of them) for the nxt 4 days. Yahoo! I’m surprised we didnt go into Medan city. We drove for about 30mins via Lubuk Patam before reaching a mosque, Mesjid Istikmal Pasar Bengkel, so that we can do our Zuhur prayers. Both Ramses and Torang were Christians but they understood our need to stop for prayers and halal food. 🙂 After that, we drove for another hour or so to Tebing Tinggi for lunch at a restaurant, Bayu Lagoon. Food was ok-ok. We continued our journey for another couple of hours towards Siantar and eventually Parapat. Traffic is what everyone says. Horrendous. If you think Spore drivers are inconsiderate hooligans… you should see how these Indonesians drive. I had to peel my eyes away from the road, close my eyes and pray we arrive safely. Which we did. Ramses switched off the a/c and winded down the windows because hubb requested for a smoke. As the traffic died down and we go up a winding road, the atmosphere changed and the temperature dropped. Almost similar to going up Tangkuban Prahu in Bandung. After several turns, the lake emerged and took my breath away. So you can imagine how long we’d travelled from the airport to Parapat. The sun was almost setting. To make matters worse, we missed the vehicle ferry and the next one was in 3hrs. So Ramses called Ridu and decided to leave the car behind in Parapat and took us to the passenger ferry instead for a 30min ride to Samosir island. We were dropped off right at the door of our villa and finally checked in at about 8pm. Oh, by the way, there is no Wi-fi connection on the ENTIRE island. Some guy doing the road repairs accidentally cut the cable (or so they say) and therefore, no access to the rest of the world on this island. And apart from my villa, most other villas on this islands has no airconditioner in their rooms because they say theres no need to. At night, its pretty cool. Especially if your room is right by the lake like ours. The weather is pretty tolerable in the day. And some villas have no water heater as well. FYI. LOL! 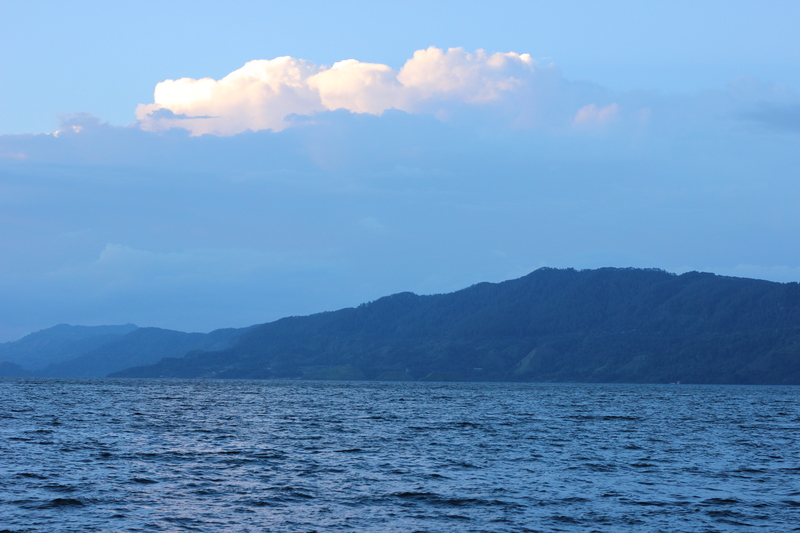 Can I have the contact of Ridu cos Im going to Lake Toba in this coming June 2014.